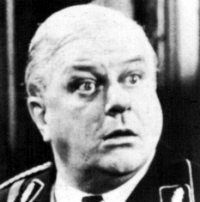 Charles Durning joined the US Army when he was 17 years old, and during World War II he was seriously wounded by a mine and suffered severe bayonet wounds in hand-to-hand combat with Nazis. His unit was eventually defeated in Belgium by an SS Panzer unit, but Durning escaped and was spared the fate met by many of his friends -- the infamous Malmedy massacre, in which German officer Joachim Peiper had over 100 American prisoners shot dead without warning as they stood in a field. On 6 June 1944, Durning was with Allied troops for the invasion of German-occupied France in the Normandy landings. For his military service, he was awarded three Purple Hearts and a Silver Star. He later had a long career as a movie actor. Hollywood Walk of Fame 6504 Hollywood Blvd.